I am pretty embarrassed to say that I carried my camera around the entire day and evening and only ended up taking pics of my breakfast at McDonald's. I'm not embarrassed to have ate breakfast there; 3 or 4 times a year won't kill me (but I went to the gym after, just in case). 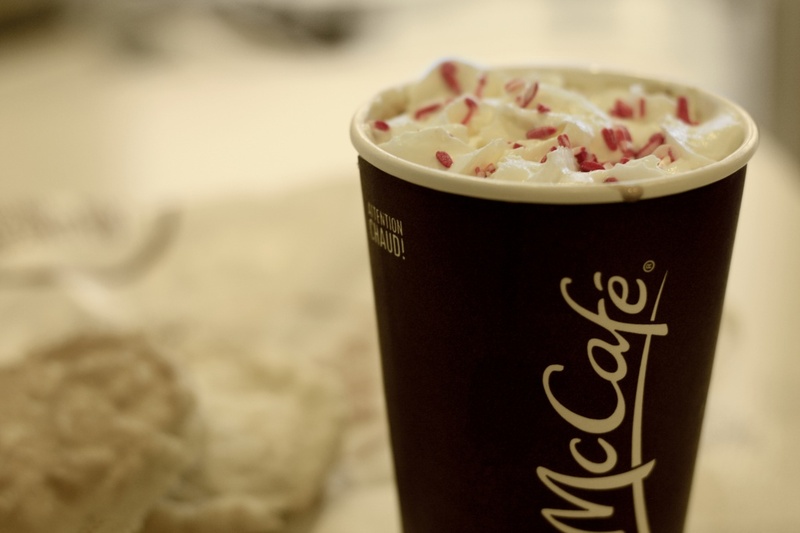 I tend to only go there when I have coupons - this delicious peppermint mocha was free. And the buttermilk biscuit was worth every 99 cents (plus tax) I spent on it. Tags coffee, 50mm, breakfast, mcdonald's, biscuit, candy cane sprinkles! this could be an ad! great shot! I love how everyone throws in a disclaimer whenever we eat at McDonald's, lol. Nice warm tones and a rather Christmas'y shot. Looks sort of like one of their ads actually. Yummy. @pwallis Ya, I know! It's silly, but I couldn't NOT do it.